The Pink Ribbon is a symbol of breast cancer. The Thane Municipal Corporation (TMC) has denied permission to breast cancer awareness activist Devieka Bhojwani's foundation called, Women's Cancer Initiative to put up advertisement hoardings raising awareness about breast cancer in Thane. 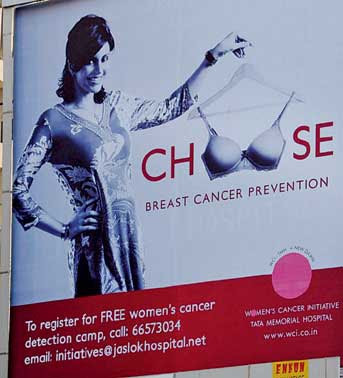 The hoardings which are up in South Mumbai at Jaslok Hospital, opposite the Cadbury House at Mahalaxmi and Chowpatty show celebrity Mandira Bedi holding up a bra and urging women to become aware of cancer awareness. Showing the bra is bad thing, showing bra, using bra in advertisement is not proper thing. I think there is no need for bra, they should have shown cancer patients breasts. Dirty mind even rapes a 1-year-old girl. "The visual (pictures) running with the advertisement are improper. We cannot have a bra being shown. If the pictures are replaced and socially proper pictures are used, we will allow the hoardings to be put up. Then, there is no problem." Do you think using Bra in advertisement is not proper in a democratic nation? What is in Bra ? Do you think showing bra in advertisement is bad is it adult advertisment? When I look at the ad, in first glance it fails to bring seriousness of breast cancer drive. Woman is smiling and the manner she is holding bra fails to deliver sincere message. They could take off straps and hanger and fit breast in the two O alphas. It more appears like inner garment ad. But bra should not be reason to ban ad. There are quite a few ads which are not appropriate to watch with family, If they ban this ad then there is lot to ban out there.